This page is still being written… pardon the dust!!! I was asked to talk about Knative and decided to try out Google cloud’s GKE with service mesh from solo.io instead of Istio. This is only needed if you are interested in pushing changes from the VM to your git repository. I needed that to show you how to make Knative build from source in the demo screencast. As part of provisioning the VM, Vagrant will copy a specific ssh key file for pushing changes into Github. You may choose to skip that by commenting out these lines. Otherwise, tweak them to point to the proper file in your environment. This is only needed if you did not comment out the Vagrantfile section mentioned above. Change the user section to make this you. # To save snapshot. You can create multiples of these. The flaskapp.git repo gives us an easy to deploy and use application that we can containerize. Docker was installed as part of the Vagrant provisioning, so you can also try running the app from a container in the VM. The Dockerfile used is as simple as it gets. $ cd /vagrant/flaskapp.git/ && docker build -t foo . An important caveat here is that the project is part of te image name. Pay attention to that when we start referring to it from the k8 yaml files! Deploying the cluster is as easy as invoking these commands at this point. # This takes about 3 minutes... Good time for getting a coffee refill?!? # You should now see your newly constructed K8 cluster! At this point, we can have the app running in the cluster by using some pre-canned yaml files I created in the k8s folder. Just for comparison sake, you can see below the old-school way for having a deployment in Kubernetes. This little yaml is equivalent to foo.yaml shown above, and more! Pardon the mess… I’m still organizing the contents of this page. This is just a dirty placeholder. 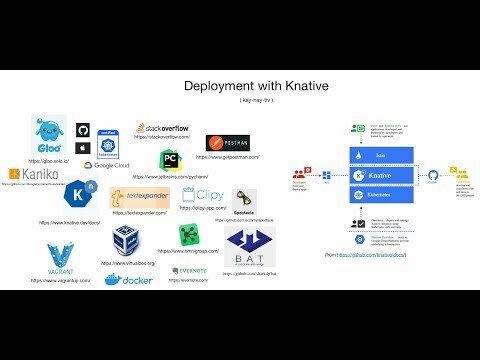 A repo contains the steps and slides used for demonstrating how you can deploy a simple application on Kubernetes via Knative. It starts off showing the app running in the VM, followed by docker in VM, and then deployed on a Kubernetes cluster at the Google Cloud.